The incoming speaker of the House said impeachment shouldn't be done — or avoided — "for a political reason"
Incoming House Speaker Nancy Pelosi isn't ruling out President Donald Trump being indicted in office, telling the "Today" show in an exclusive interview she considers it "an open discussion." While standing Justice Department guidelines advise against indicting a sitting president, Pelosi told Savannah Guthrie that it's possible special counsel Robert Mueller could still seek one. "I think that is an open discussion in terms of the law," she said ahead of reclaiming the House speaker's gavel Thursday, becoming the first lawmaker to do so in recent history. 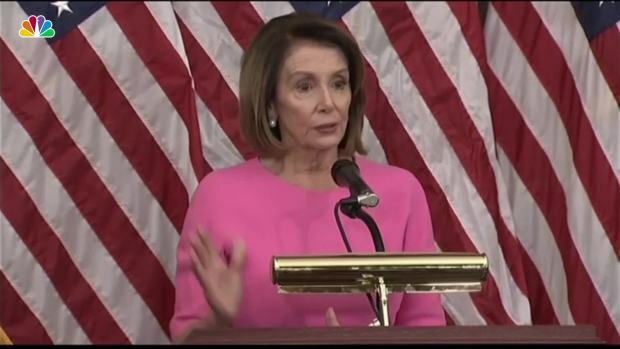 Democrats have discussed whether to impeach Trump, and Pelosi didn't rule it out, saying it shouldn't be done — or avoided — "for a political reason." U.S. Rep. Nancy Pelosi, D-Calif, on Wednesday said she is the "best person" to serve as Speaker of the House.